Kawasaki has taken the wraps off of its 2015 KX450F and KX250F motocross machines, and if 2014 is any indication, the key improvements to both models should keep them competitive in the cut-throat world of motocross competition at the professional and amateur levels. Both the KX450F and KX250F have been gone over with a fine-toothed comb to enhance the power and increase the durability of their high-winding four-stroke engines, and Kawasaki has also made significant changes to their suspension, chassis and braking components in the hope that the 2015 models can maintain a winning pace on racetracks around the world. Both machines benefit from improvements made by Kawasaki’s factory race team, which fields reigning AMA Supercross and Motocross Champion Ryan Villopoto. 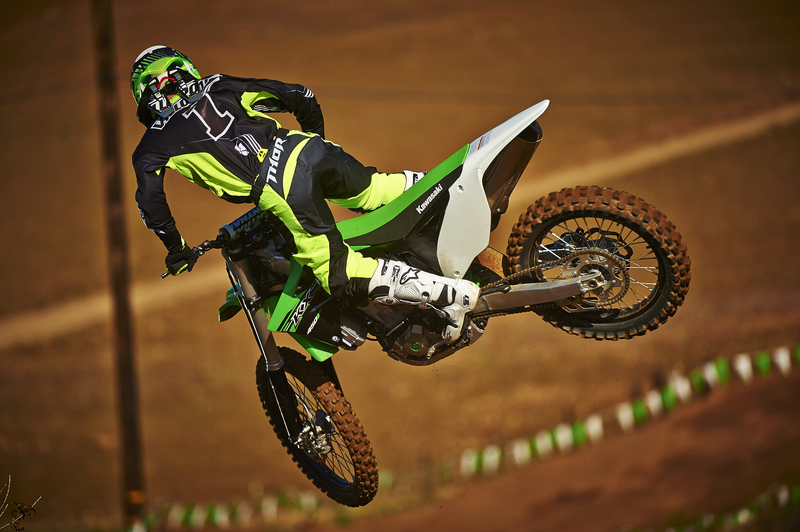 The KX450F’s powerplant has been the best in its class for the past three years, so for 2015 Kawasaki focused primarily on making key upgrades to its chassis, suspension and brakes to better cope with its title-winning power and make it more comfortable in the ergonomic department. That doesn’t mean, however, that Kawasaki engineers left its 449cc, fuel-injected, DOHC, single-cylinder four-stroke engine untouched. The KX450F retains the same 96.0 x 62.1mm bore and stroke of its predecessor, but Kawasaki has sought to improve the engine’s durability even more by incorporating a revised F1-style “bridged box” piston. The piston design, which duplicates the one found in Ryan Villopoto’s Monster Energy factory bike, features short skirts with reinforced external ribs to improve rigidity while remaining feather light. Thanks to the new piston’s slightly higher compression ratio (12.8:1, up from 12.5:1 in 2014), the KX450F is said to deliver a harder mid-range hit and a more robust top-end feel than the 2014 model. However, that ferocity can still be altered via Kawasaki’s DFI couplers, which allow the rider to change the fuel-injection mapping from Standard to Hard or Soft settings to increase or decrease the engine’s snap to suit track conditions and rider preference. The DFI coupler cap is easily accessible, allowing the power swap to be accomplished in just a few seconds. 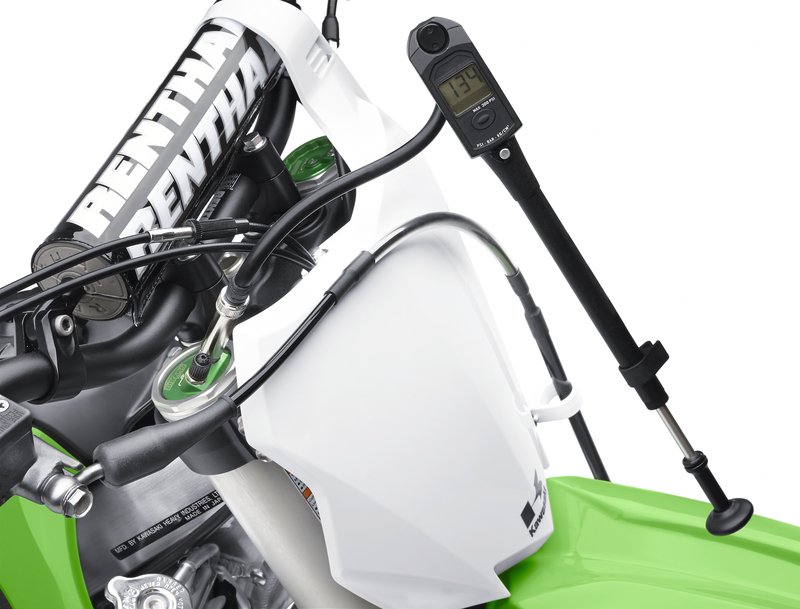 Kawasaki engineers have also revised the KX450F’s ECU system for 2015 with new programming to enhance traction by quickly retarding the ignition when rear-wheel speed increases too quickly, such as from sudden, excess wheelspin. The ECU is still fully re-programmable. Custom maps can be created using the optional accessory Kawasaki Racing Software Kit to give riders total power adjustability. This is the same tool used by Kawasaki factory and privateer teams in motocross and supercross. Part of the ECU’s function includes Kawasaki’s innovative Launch Control mode, which works by retarding the ignition in first and second gears with the goal being increased grip in low-traction situations, such as when launching off of a concrete starting pad. The Launch Control is activated with the press of a button on the handlebar when the machine is in neutral, first or second gear. Shifting into third gear automatically deactivates the system to return ignition timing to the stock setting. 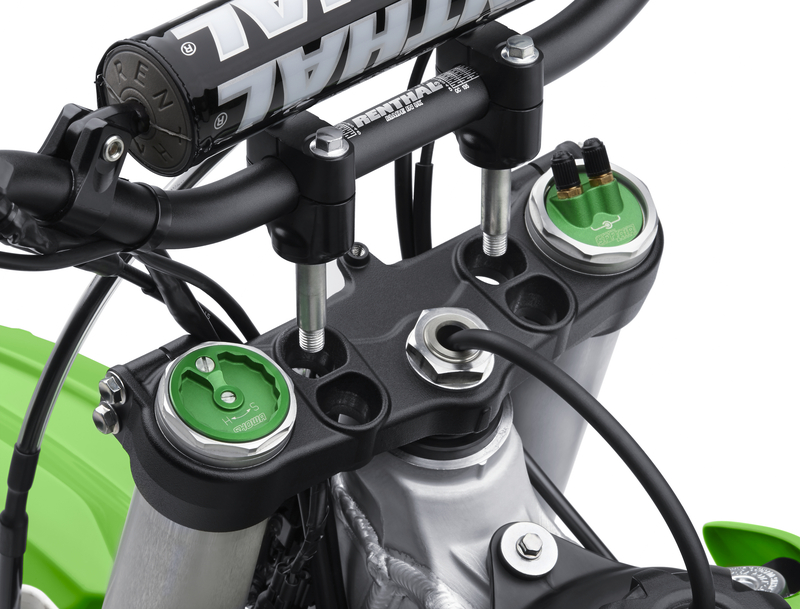 The 2015 KX450F also gets upgraded suspension components for 2015, including Showa’s latest Separate Function Fork (SFF) with a Triple Air Chamber (TAC) that separates the damping forces into the left fork tube, while a pneumatic spring is housed in the right tube. The air fork design is intended to provide less friction and lighter weight than a conventional spring fork. 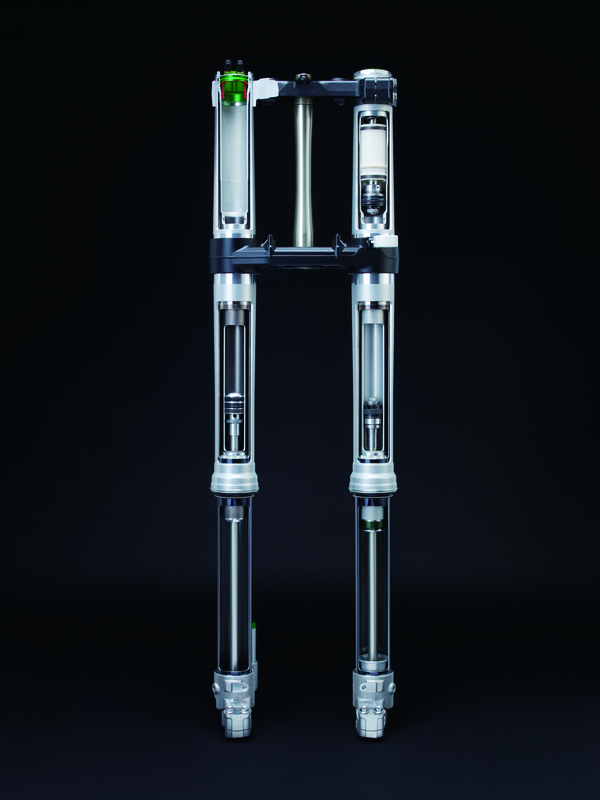 True to its name, the Triple Air Chamber fork features three separate chambers with individual air volumes that allow more precise adjustability, thanks to individual tuning. An inner 145psi high-pressure pneumatic chamber works in harmony with a 7.25psi low-pressure outer chamber and a 130.5psi high-pressure lower chamber to replace the conventional steel coil spring. Kawasaki says that the advantage of the air spring includes less oil contamination due to the lack of metal-on-metal particulate contamination that can be found in forks with coil springs. To make the suspension action even slicker, the SFF-Air TAC uses a titanium coating on the inner. Suspension tuning with the Showa SFF-Air TAC is easily accomplished via a Kawasaki Genuine Accessories 0-300psi Digital Air Pump that is included with every KX450F — a noteworthy selling point, as some other manufacturers with air fork-equipped models do not include a pump with their bikes. The pump’s digital display offers the rider a way to precisely tune the air pressures, and as an added feature, the casing handily stores the DFI Couplers for the fuel injection system — and believe us when we say they are pretty easy to lose! Out back, the 2015 KX450F’s Uni-Track linkage rear suspension gets a Showa piggyback reservoir shock with revised valving for improved damping in high-speed conditions to enhance the bike’s stability and resist bottoming when landing off of jumps. A slick Kashima coating inside the shock body is used to reduce friction and foster smoother suspension action. Riders seeking a reduced seat height may also want to opt for Kawasaki’s accessory rear suspension tie rod. The KX450F’s handling and chassis feedback is said to be improved for 2015 via tweaks to its aluminum perimeter frame, or, more to the point, its rear subrame. A lighter subframe has been incorporated to improve mass centralization for quicker handling and a more nimble feel in the saddle. 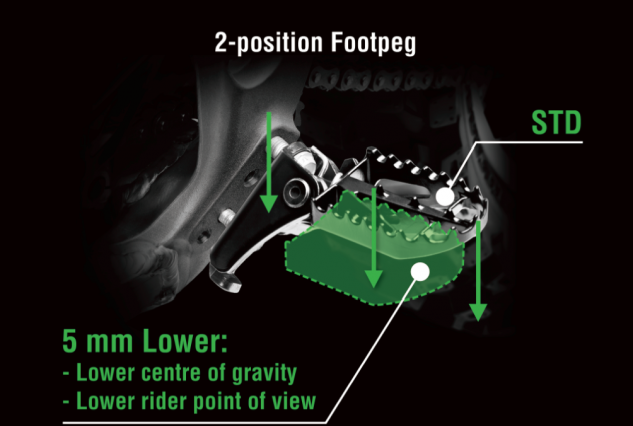 In the braking department, bigger is better on the 2015 KX450F, as Kawasaki engineers have fitted an oversized 270mm, petal-shaped front brake rotor designed in conjunction with world-renowned supplier Braking. The 20mm larger front rotor is paired with a 240mm Braking rear rotor. The petal-shaped rotors are designed to shed mud in sloppy riding conditions and offer more surface area to disperse heat, thus maintaining more consistent braking performance. The KX450F’s axles are also new for 2015, lightened by 31 grams up front and 32 grams out back. Kawasaki appears to be committed to making the KX450F the most ergonomically friendly 450cc motocross machine on the planet, and its four-position upper triple clamp features two sets of handlebar mount slots to allow the rider a choice of four handlebar positions — 25mm forward, 15mm forward, standard or 10mm rearward, while its footpeg brackets allow the rider to set the footpeg height in the standard position or lower it by 5mm. Additional comfort details include careful flush-fitting of the seams between the radiator shrouds, seat and side covers to help avoid riding gear snags for freer movement on the bike when transitioning from standing to seated, such as when cornering. 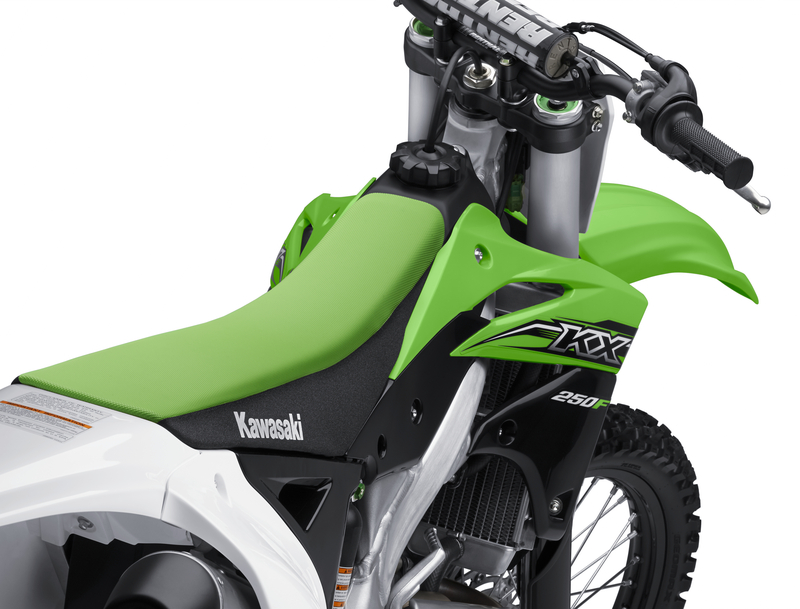 The KX450F’s compact fuel tank is also designed to form a smooth straight line with the seat, allowing easy rider movement. The 2015 KX450F also gets a new graphic treatment with a Lime Green finish and factory-style decals. Green-anodized engine plugs, oil cap and generator cover plugs, as well as green alumite suspension adjusters and black alumite wheels give the big KX an aggressive, factory fresh look that is expected to last, as the coated components are corrosion and scratch-resistant. No other 250cc four-stroke motocrosser can match the winning pedigree of the Kawasaki KX250F. The green machines have dominated the class practically without interruption for the past decade, and the KX250F proved to be competitive in shootouts again in 2014 despite heavy competition from a revolutionized Yamaha YZ250F. Kawasaki revamped the KX250F in 2014 by adding key improvements to an already strong engine package, including the KX450F-derived Launch Control mode that adjusts the bike’s power characteristics to improve traction off the starting line, and plug-n-play DFI couplers that allow the rider to alter the fuel-injection mapping and tailor the engine’s power to track conditions and rider preference; the quick and easy DFI coupler swap allows the rider to select between smoother, standard or harder-hitting power. For 2015, the KX250F receives even more engine updates to improve durability under stress of competition. The biggest change inside the KX250F’s liquid-cooled, DOHC, 249cc motor involves the piston. The KX250F’s bore and stroke remain the same at 77.0×53.6mm, but Kawasaki engineers have fitted a reinforced “bridged box” piston, a technological design gleaned from F1 auto racing and used on last year’s Monster Energy Kawasaki factory race bikes. The bridged box piston features short skirts with reinforced external ribs to increase the piston’s rigidity. Kawasaki says that the new piston is slightly heavier than the old one, so the weight penalty was mitigated by a new piston pin that is lighter than last year’s pin without sacrificing durability. 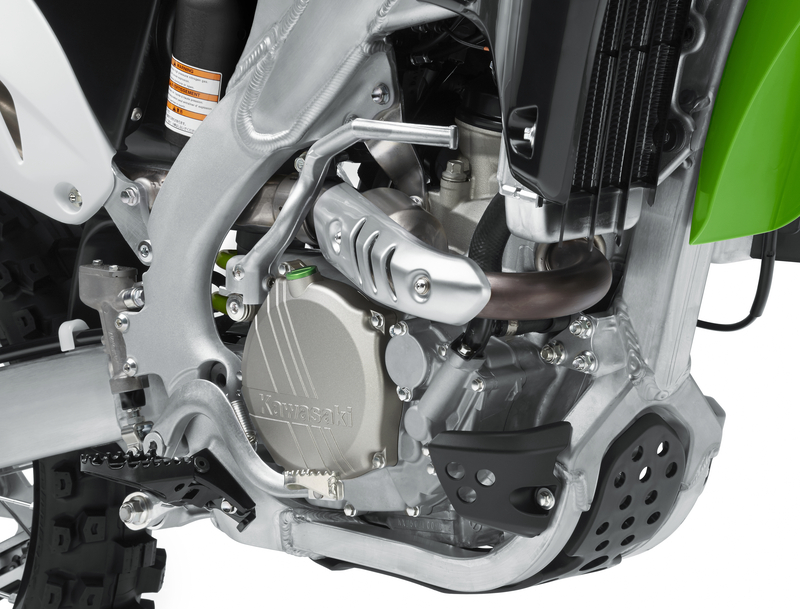 The KX250F also receives a slightly heavier ignition rotor, weighing 9.5kg-cm² compared to the 2014’s 9kg-cm² unit, to smooth out the power and improve traction when driving out of corners. Kawasaki was the first manufacturer to use a dual-injector fuel injection system on a production 250cc four-stroke motocross bike. Its Keihin Digital Fuel Injection (DFI) system uses a 43mm throttle body with a second injector that delivers an extra squirt of fuel under acceleration to maximize power, particularly at higher rpm. The second injector is located higher up in the air duct, which Kawasaki says helps to create a wider and more potent powerband. For 2015, Kawasaki has made a slight revision to the system by reducing the downstream injector droplet size to 75 microns for 2015; the upstream injector still sprays particles with a droplet size of 120m. The finer size and wider spray pattern of the downstream injector is intended to fortify the KX250F’s low- to mid-range power and improve throttle response. Revised ECU settings match the injector and magneto rotor changes. Kawasaki engineers have also made changes to the KX250F’s suspension settings, chassis and brakes, all of which are intended to maintain its winning heritage. Up front, Kawasaki has opted to hold off on switching to air forks on the 250, instead retaining a second-generation version of the 48mm Showa Separate Function Fork (SFF) that it introduced to the class in 2011. The SFF fork separates the damping and spring preload duties. The right fork leg houses steel coil spring and incorporates a preload adjuster that simplifies preload and ride height adjustment with the simple turn of a wrench rather than requiring fork disassembly to accomplish the task. The left tube houses the damping system that controls ride quality. The SFF fork features 30mm main- and 35mm sub-pistons that move more oil volume at a lower internal pressure intended to keep the fork action smooth. Other friction-reducing efforts include a super-hard titanium coating on the inner fork tubes to prevent stiction and improve overall fork action. A fully adjustable Showa piggyback reservoir shock resides out back, but it has been revised with firmer damping specs to match the fork. The state-of-the-art shock features high- and low-speed compression damping adjustability, and Kawasaki engineers have paid attention to details to keep eliminate as much friction as possible by incorporating a self-lubricating alumite coating on the inner surface of the shock cylinder wall. These features help increase rear-wheel traction and power transfer to the ground. 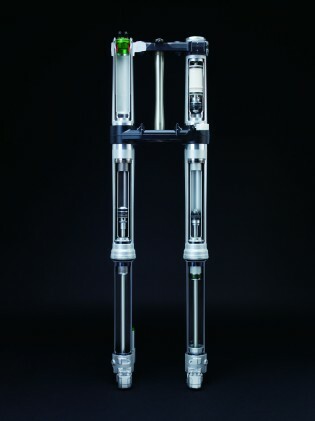 The KX250F’s chassis now carries the slimmer subframe also introduced on the KX450F to improve mass centralization and allow easier rider movement in the cockpit. Carrying ergonomic comfort even further in 2015, the KX250F gets a new four-position upper triple clamp that features two sets of handlebar mount slots to allow the rider a choice of four handlebar positions — 25mm forward, 15mm forward, standard or 10mm rearward. The increased rider adjustability also extends to the footpeg brackets, which allow the rider to set the footpeg height in the standard position or lower the height by 5mm. To improve braking power and feel, the 2015 KX250F is fitted with the new 270mm oversized Braking-brand front rotor also found on the KX450F — it’s 20mm larger than the 2014 rotor. The rear rotor still measures 240mm, but both have a factory-style petal design that is intended to shed mud more easily and look more stylish. 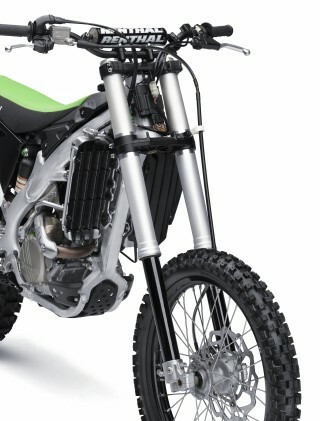 The KX250F’s axles have also seen a slight weight reduction of 31 grams up front and 32 grams out back. Completing the KX250F package are new-for-2015 styling cues that include green-anodized suspension adjusters, engine oil cap and generator cover plugs, and black alumite-coated wheels. Kawasaki’s embossed design on the clutch cover also features a nifty trick — the logo gradually reveals itself as contact from the rider’s boots wears away the painted surface. 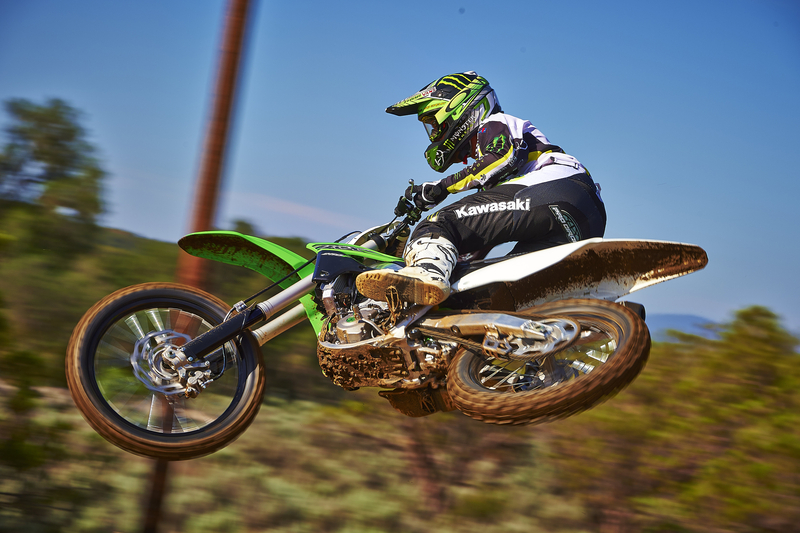 Price and availability are yet to be determined for the 2015 Kawasaki KX450F and KX250F. For more information, contact your local Kawasaki dealer.